In the U.S., as many as one in five people over the age of 60 cannot or do not drive. Yet many of these same seniors name transportation as the second most important issue to them, after only health, according to a survey by AAA. Americans turn 65 at a rate of 8,000 per day. The population of Americans 65 and over is predicted to double between now and the year 2030. Today as many as 6 Million people report skipping or delaying health care services because of inadequate transportation. Of the American population aged 55 or older, three-fourths have one or more serious or chronic health conditions, which includes heart disease, cancer, COPD, diabetes, arthritis, asthma, and other chronic diseases. Seniors with these conditions need frequent access to health care facilities and treatments. For example, those who are suffering from kidney failure might need to go to a dialysis clinic three times per week. Two-thirds of these seniors rely on others to transport them to-and-from these important medical services. NEMT, or non-emergency medical transportation, helps fill the need for those people who need regular transportation to and from health care services. For individuals who have mobility issues and who may not be able to use public transportation, drive, or walk, these services are ideal. NEMT companies exist to help these patients arrive safely at all of their medical appointments on time. One of the advantages of NEMT to the customer is that the transportation professional picks the patient up at their door and delivers them to the door of their medical appointment. The driver stays to make sure the patient is in the right place at the right time. 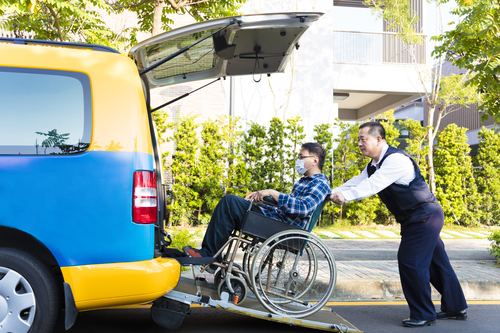 If you start a non-emergency medical transportation business, you’ll be helping seniors and people with mobility issues with one of their most important needs. Click on each section to read more about our Non-Emergency Medical Transportation start-up process. Transportation license and operational applications for NEMT can vary by state. As part of our services, we will complete the necessary operational application and all the licensing paperwork for you. Our professionals know the transportation licensing requirements for each state and will ensure your business meets the requirements. First we’ll incorporate your NEMT business so your company will have the NPI and tax ID numbers it needs. Our team will start the process of getting your non-emergency medical transportation business approved to accept benefits from clients who use the Medicaid system. care centers as well. Different states reimburse for Medicaid in different ways, and we can help guide you through the process in your state. Some states also require that if you start a non-emergency medical transportation business, you also have to register with the state’s transportation broker. If this is applicable to your state, it may be possible to coordinate Medicaid reimbursement and other forms of reimbursement for medical transport with the transportation broker. Our business start-up and consulting staff will help you start a non-emergency medical transportation business with all the proper human resources documents. These will include competency evaluations, in-service continuing education materials, personnel files, and other documentation required for the business to run smoothly. In addition to meeting your licensing requirements, our business startup and consulting service will also provide you with the documents your business will need to succeed. This includes policy and procedure manuals that are specific to your state as well as the operation documents you’ll have to file with federal and state regulators in order to stay compliant. We’ll customize all of these materials for you with your business’s distinct logo and your office and staff details. Our business start-up and consultation service will assist your business with the marketing materials you’ll need to get your NEMT business started. These marketing services include a customized SEO (search engine optimization) website. Your SEO website is tailored to help your business appear first in search results when someone in your area searches the internet for non-emergency medical transportation. These websites work with popular search engines including Bing, Google, and Yahoo. In addition, we’ll customize business cards and brochures with the details of your non-emergency medical transportation business. You’ll receive 1,000 glossy-finish business cards and brochures in full color, customized with your business logo and details, as well as design files so in the future you’ll be able to create your own unique marketing materials. Your NEMT will have access to a variety of online training materials that will help you get your new business off on the right foot and keep your employees up-to-date and professionally trained. These materials include in-service education plans, teaching guides, driver training programs, and webinars. Included with our lifetime business training is consulting on any questions you have, including questions on ongoing staff training, available to you at no extra charge. Our consulting services will make sure you understand patient admissions policies, medical scenarios, emergency scenarios, referrals, review policies, marketing, and obtaining new clients. We certify our non-emergency medical transportation consultants so they’re each able to provide you with ongoing support and coaching over the phone or via e-mail, whichever is more convenient for you. Our consultants will help you navigate through all the issues that a new business typically encounters so you’ll have the best chances of successfully operating your transportation company. We value all of our clients; it’s important to us that we maintain a productive, ongoing relationship with each of our transportation provider clients. As one of our clients, you’ll have exclusive access to our patient referral website. This website serves as a resource guide that will help you find and contact patients in your area who need your non-emergency medical transportation services. Businesses who successfully complete our training programs and adhere to the strictest standards of excellence in helping clients, as well as following federal, state, and local laws and guidelines, may be listed in our directory. In addition, your company will have access to our Veterans’ Home Care Patient Resource and Support Programs. This program provides resources for military veterans and the surviving spouses of these veterans, a group that includes approximately one-third of U.S. seniors. Our business start-up and consultation services can help set up your business to provide companion services and other personal services to these veterans and their spouses. 21st Century is a leader in the Home Health Industry. As such, we have negotiated proprietary pricing with providers of software, scheduling, dispatch, and insurance companies and other allied organizations. By taking advantage of our proprietary pricing, you’ll be saving your company thousands of dollars. We provide these discounts only for our non-emergency medical transportation business clients. Call us today to ask about pricing and details.